Kansas City USA – The Westport Coffeehouse Theater will be the venue location for a live concert performance by the Christopher Burnett Quartet with special guest, Michael Jefry Stevens at 7 p.m. – 9:30 p.m., June 6. Tickets are $10 at the door for local audiences and $5 to watch the live webcast online from anywhere around the world. • What About The Future? CD Recordings will be available at the ticket table. And, all music is available at the major digital music stores like Apple Music, iTunes, CD Baby, and Amazon. Several compositions will be debut performances. Pianist, Composer and “Steinway Artist,” Michael Jefry Stevens has released over 80 CDs and composed over 340 works for both large and small ensembles. An active bandleader for over 40 years, his current working musical ensembles include the “Conference Call Quartet,” the “Fonda/Stevens Group,” “Eastern Boundary Quartet,” his collaboration with New Orleans horn man, Brian “Breeze” Cayolle and “Trio Generations” featuring saxophonist Oliver Lake. Burnett (Selmer Saxophone Artist), guitarist Charles Gatschet, bassist Andrew W. Stinson, and percussionist Clarence Smith are members of Christopher Burnett’s guitar quartet. The quartet also forms the basis of an international ensemble, The Dino Massa Kansas City Quintet, whose critically acclaimed debut release titled “Echoes of Europe” is available worldwide via the Kansas City-based ARC label. Christopher Burnett’s ensembles have performed at the top venues in Kansas City, and the quartet is also scheduled to perform at the 28th Annual Roots Festival in Paola, Kansas on Aug. 26. Westport Coffeehouse opened in 1996 and is a full-service coffeehouse with an exceptional “black box” theatre. Also known as an oasis in the middle of Westport” “Entertainment District,” amenities and attractions include high-speed Internet, theater and comedy events, and live music performances in the Westport Coffeehouse Theater. Drinks are a specialty with choices ranging from smoothies to ice cream and of course exceptional coffees. Grilled panini sandwiches and baking “by Pam” add to the offerings. 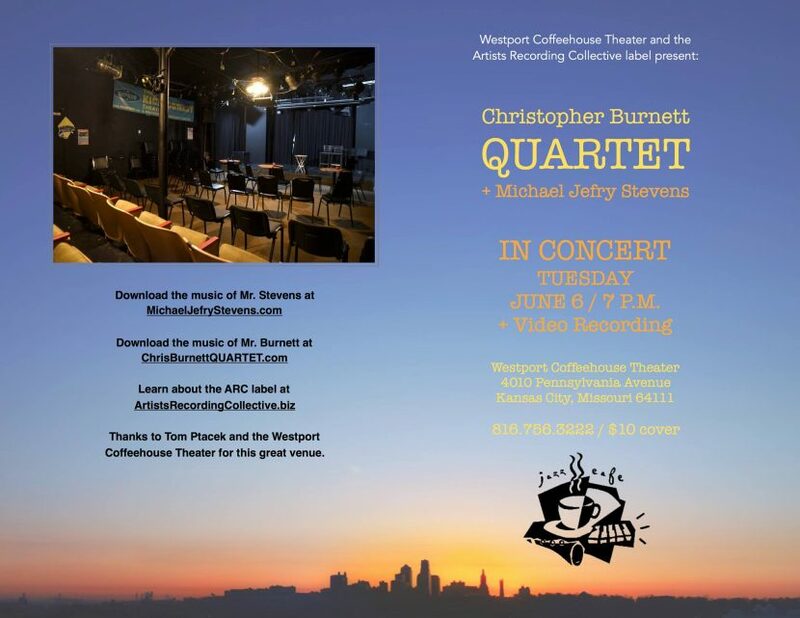 Cost: Payment required – Christopher Burnett Quartet + Michael Jefry Stevens at Westport Coffeehouse Theater in KC – LIVE online show Tuesday, June 6th at 8:00 pm EDT 7:00 pm CDT. NOTICE: CONCERT WINDOW TICKETS ARE FOR THE LIVE STREAM ONLY. THE LIVE STREAM IS A WAY TO BE “AT THE CONCERT” NO MATTER WHERE YOU ARE IN THE WORLD! JOIN US. WE WILL STREAM A SEGMENT OF THIS EVENT BEGINNING AT 7:00 PM CST.